Showing 9 articles from November 19, 2018. 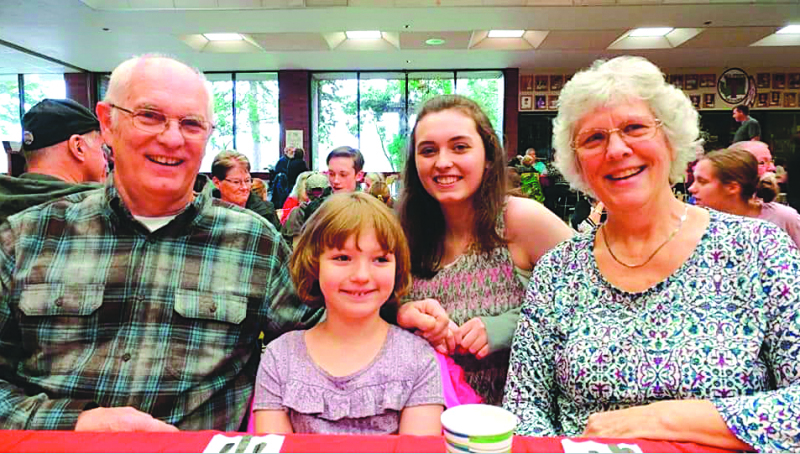 The Toledo Elementary and High School hosted the annual Grandparents Thanksgiving Luncheon last Friday. On this day, the grandparents are able to choose to dine with their grandkids at either the elementary school or high school with reservations, and eat a Thanksgiving meal. Toledo Indians have done it again! 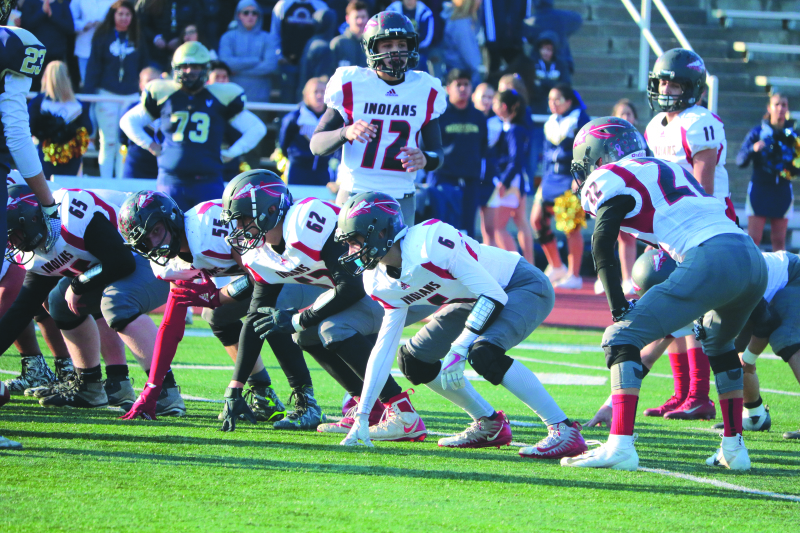 On Saturday Toledo Indians beat out Tri Cities Prep Jaguars in a score of 34-23 advancing to the next round of semi-finals. It is back! 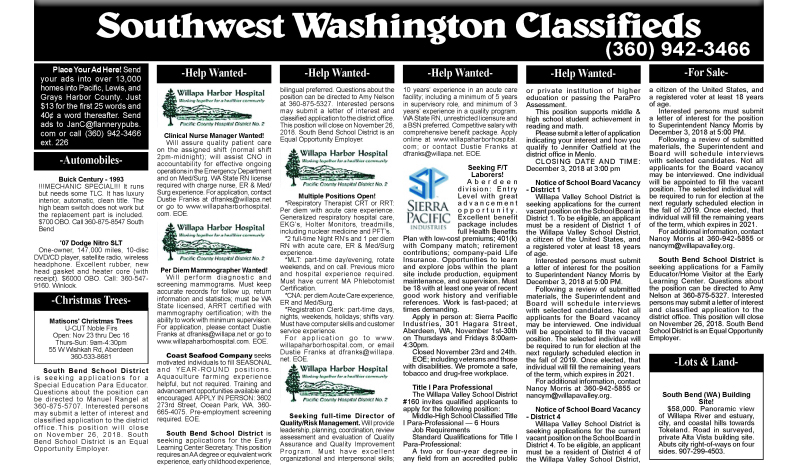 The Winlock Giving Tree will be stocked with tags for area children in need of a Christmas gift. IGA and Timberland Bank have each graciously allowed space for a Giving Tree and a donation box. Both trees will be up and ready November 23. Please pick a tag from the tree, purchase a gift and return the gift, along with the tag, to either IGA's or Timberland Bank's donation box. 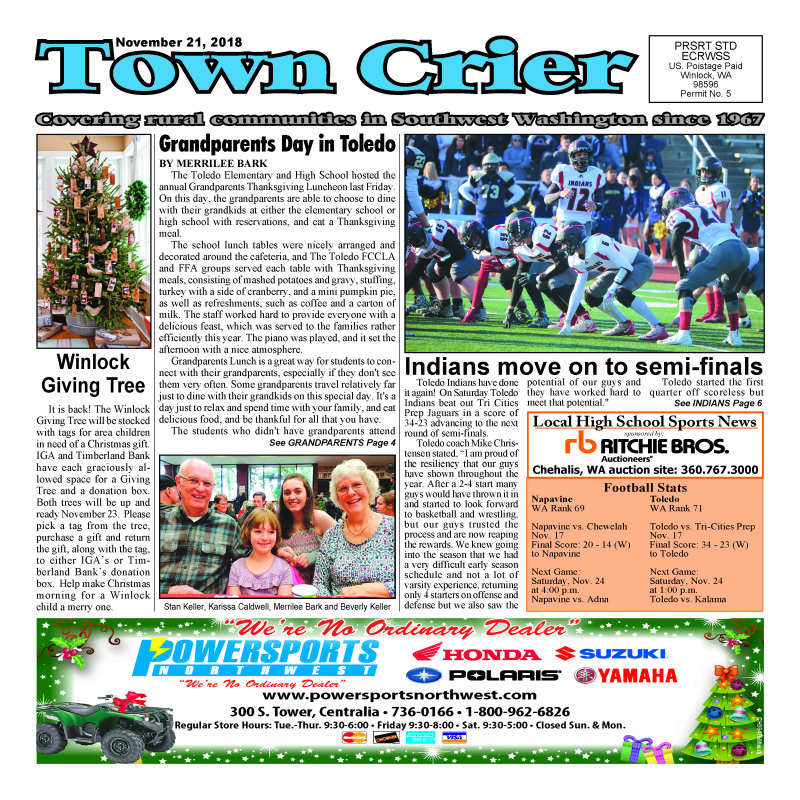 Help make Christmas morning for a Winlock child a merry one. Willapa Harbor Business Week is reportedly all set after negotiations with the Raymond Theatre concluded. Last week the Herald published an article regarding a surge in the rental fee for the theatre and new details have since emerged with a retraction requested. Previous information has been accused of being incorrect and non-factual regarding the rental fee for theatre use during Business Week. During the November 5 Raymond City Council meeting Council members grilled Mayor Tony Nordin about the fee for the week being raised to $2000 by new Theatre Manager Diane Ziel. Days after the meeting several council members informed the media that a deal had been reached: $1200 for the week. Photo by Jeff Clemens -Trace Conklin (left) watches as a log heads into the mill while students observe the height of the walkway. 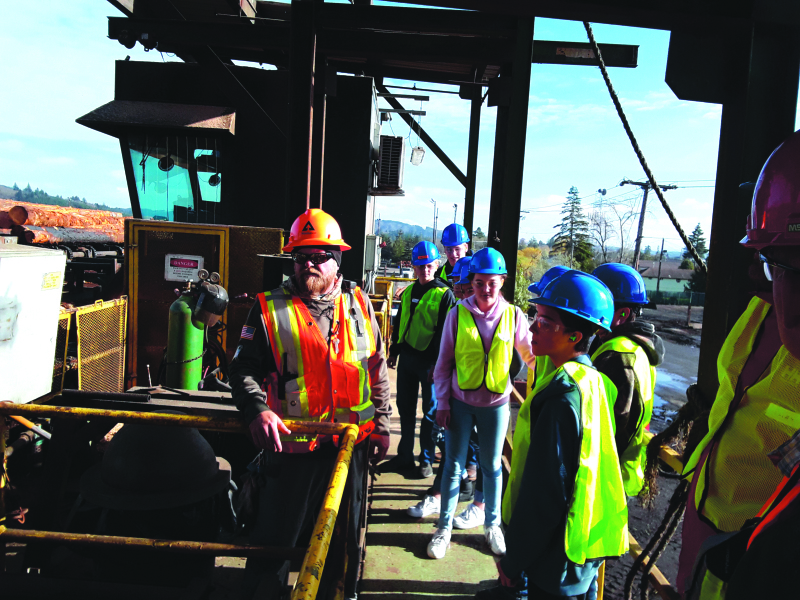 The Weyerhaeuser Raymond Lumber hosted local students for Manufacturing Day at the mill on November 15. The students were provided with detailed tours around the mill to learn about its operation. Enabling them to see from start to finish how lumber is made and the entire process involved. The Herald was invited along for the ride and it sure was an experience. The Willapa Valley School District and teachers reached terms on teacher salaries. 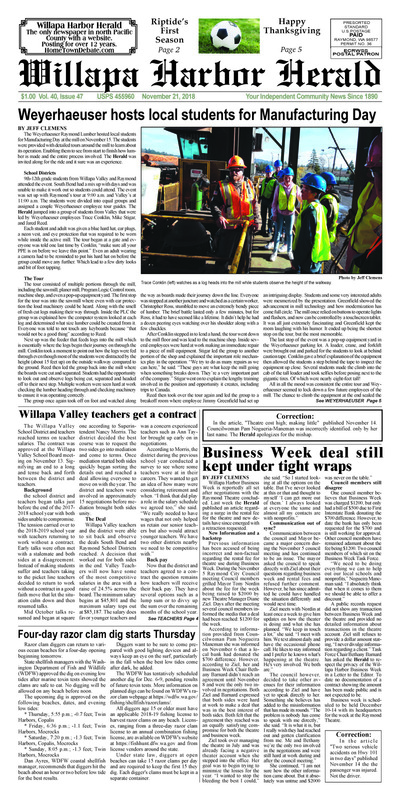 The contract was approved at the Willapa Valley School Board meeting on November 13. Signifying an end to a long and tense back and forth between the district and teachers. The school district and teachers began talks just before the end of the 2017-2018 school year with both sides unable to compromise. The tension carried over to the 2018-2019 school year with teachers returning to work without a contract. Early talks were often met with a stalemate and both sides at a disagreement. Instead of making students suffer and teachers taking to the picket line teachers decided to return to work without a contract in a good faith move that let the situation calm down and then resumed talks.